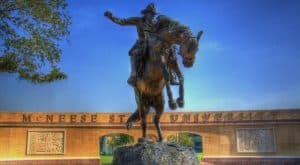 Banners at McNeese State University is annually supported by donations from area corporate sponsors. CITGO has donated $20,000 for the spring 2018 Banners program that runs this season from March 2-April 28. 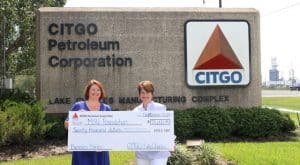 Patricia Prudhomme, left, Banners director, accepts the donation from Dana Keel, left, CITGO government and public affairs manager of the Lake Charles complex.